Share on your community forum. .NET is Microsoft's strategic platform for developing enterprise systems for the modern era. .NET recognizes and addresses the traditional difficulties facing application developers. Language interop- VB6, VC6, ASP, WinSDK. What new programming languages are offered in .NET? C# - Similar to Java and C++. 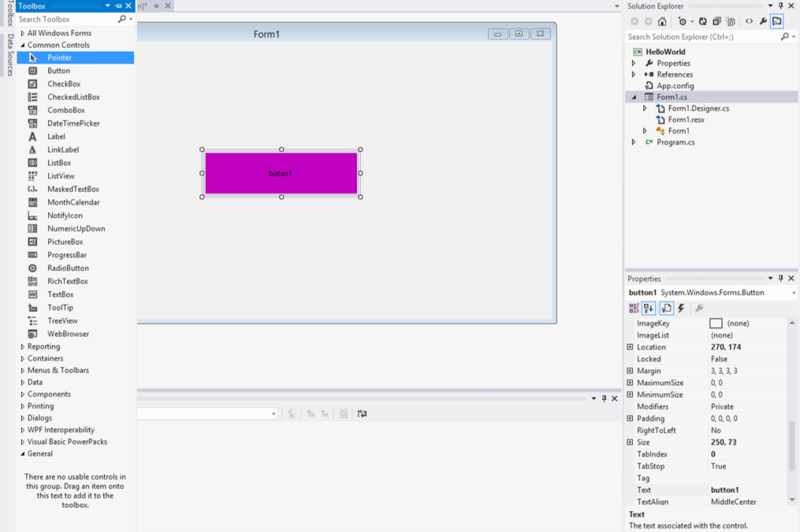 Visual Basic - Like VB6 but an Object Orientation approach. C++/CLI - New keywords that allow you to write in C++ for .NET. F# - Functional programming language. Syntax more like C++ and Java. Designed for object orientation - Started with a clean slate, Everything is an object. Safe - Find bugs early in development process. Internet Centric - Designed for developing web programs. Hi Performance - Designed for industrial strength programming. This code can be run from the Visual Studio 2013 command prompt window. Each Compiler emits the same bytecode format - IL (Intermediate Language) byte code. An assembly is a .DLL or .EXE containing managed code E.g. CSHelloWorld.exe. You can create apps that contain (or reference) many different assemblies. To illustrate how assemblies work, we'll build a simple Windows Forms application in C#. 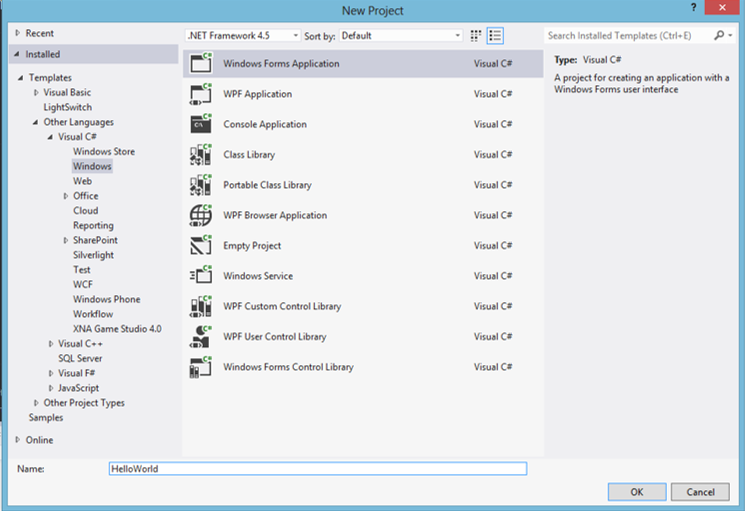 Start Visual studio 2013 and Start a New project; Choose Visual C# and Windows Form Application. Drag the bottom right of Form1 to make it larger; and from the left hand side there is a navigation bar that contain a ToolBox Item. Click this, and as you can see there are many different controls that you can access. Drag and drop the control called button (found under common controls) onto Form1, you should see a button on the screen with the writing "button1" inside it. In the bottom right there is a properties table when you select the button, in this properties window set the "Text" attribute to "Click me for hello world". Re-size the button as you wish to make it larger or smaller by selecting and edge and dragging it out or inwards. Now at the top of visual studio 2013 there is a button labelled Start with a green arrow inside it; click this when you want to run/debug your application. So click this and you will see your newly made form appear and when you press the button a message box will appear saying "hello world". Well done. You have completed the first tutorial in the C# course. There are 16 more tutorials in this course. Start the next tutorial now. Obtain your TalkIT certificate when you finish all the tutorials. Share on your community forum. Just add a comment below. You may also like to see the TalkIT blogs on new features in both C# 5.0 & 6.0. What have you found to be the most useful new feature? Just watched video by Chris Hawkes: Top 10 Programming Languages to Learn in 2016. C# was Number 1. His criteria was the industry demand for developers.